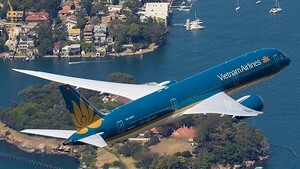 The country’s national carrier, Vietnam Airlines, recently announced that it will operate more domestic red-eye flights during peak days of Tet Lunar New Year holiday season, to meet the increase in demand for air travel and also to reduce airport overload. The earliest domestic flight will depart at 12.30am and the last flight at 11.50pm. On February 6-8 (Lunar December 26-28) and February 15-17 (Lunar January 6-8), Vietnam Airlines will operate all day to serve the surge in passengers during Tet festive season. The carrier will operate 400 flights a day during peak days of the Tet Festival, 38 percent above normal, and more than 430 flights a day on peak days after Tet holidays, 43 percent above normal. According to the airline, till now more than 308,000 passengers have booked tickets for Tet holidays and around 125,000 seats are still available for sale on many routes.